A contentious, deeply moving ode to friendship, love, and urban life in the spirit of Fierce Attachments. A memoir of self-discovery and the dilemma of connection in our time, The Odd Woman and the City explores the rhythms, chance encounters, and ever-changing friendships of urban life that forge the sensibility of a fiercely independent woman who has lived out her conflicts, not her fantasies, in a city (New York) that has done the same. Running steadily through the book is Vivian Gornick's exchange of more than twenty years with Leonard, a gay man who is sophisticated about his own unhappiness, whose friendship has "shed more light on the mysterious nature of ordinary human relations than has any other intimacy" she has known. The exchange between Gornick and Leonard acts as a Greek chorus to the main action of the narrator's continual engagement on the street with grocers, derelicts, and doormen; people on the bus, cross-dressers on the corner, and acquaintances by the handful. In Leonard she sees herself reflected plain; out on the street she makes sense of what she sees. 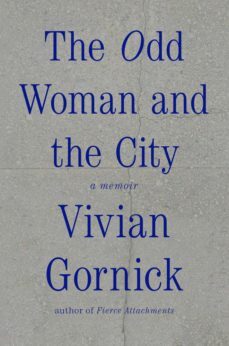 Written as a narrative collage that includes meditative pieces on the making of a modern feminist, the role of the flaneur in urban literature, and the evolution of friendship over the past two centuries, The Odd Woman and the City beautifully bookends Gornick's acclaimed Fierce Attachments, in which we first encountered her rich relationship with the ultimate metropolis.